WE ARE AWAYKE. NO SLEEPY EYES NOR FROWNING! We are AWAYKE. We aim for the best we can in accessible alternative music and we hope... that which is just mad. We aim to have at least 50% female artists simply because it just seems wrong not to do this. We have promoted music, poetry, science and art. We will work with you. We want you to have mirth. Oh and we have a fine set of many of our posters and other events for the bargain price of £15.00 plus delivery. Come and pick them up at the events is the best bet. Return of the Bass. The 18th instalment of ultra audio aceness. 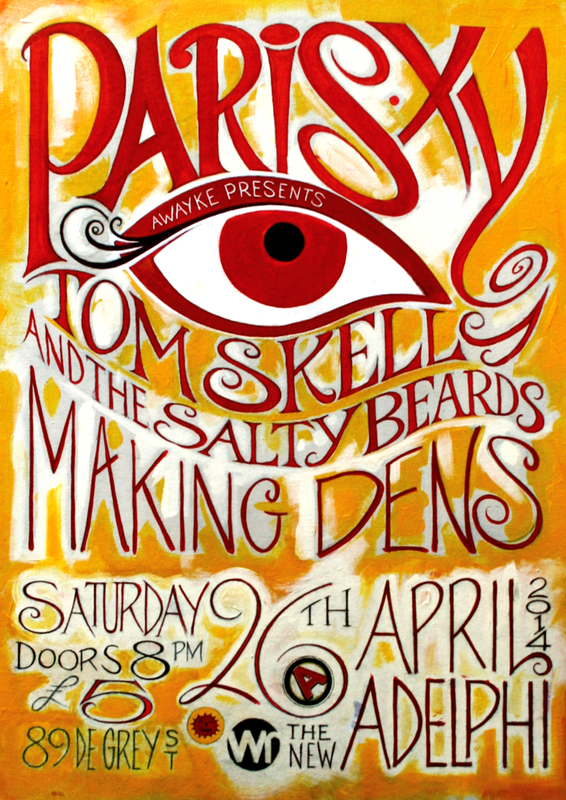 £7.00 PAY ON THE DOOR. 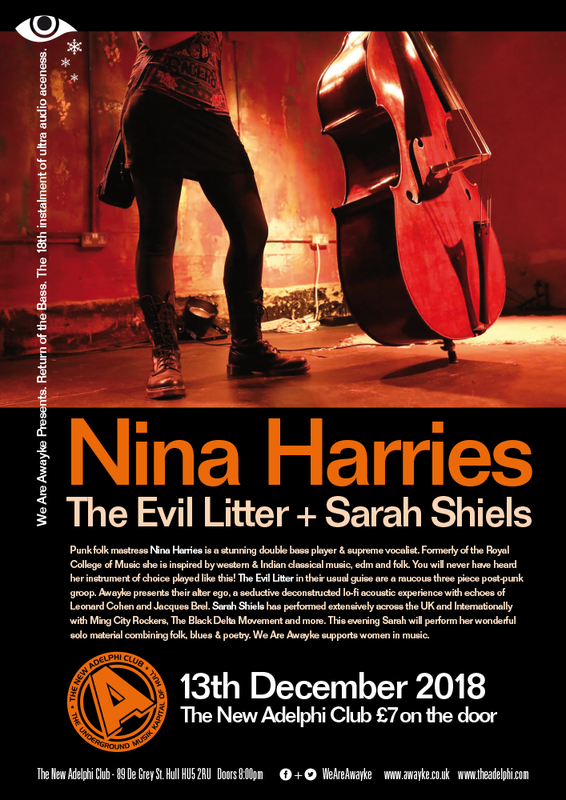 Nina Harries is a stunning double bass player and superb vocalist. Born into a family of musicians she studied at a prestigious conservatoire before breaking out into the UK festival scene. Combining the lowest of the low and the highest of the high her music is inspired by western & indian classical music, edm and folk. She is currently touring internationally with world-renowned Bangladeshi dancer Akram Khan, as part of his final solo production Xenos. She will be taking a break to return to the New Adelphi Club in The City of Hull to perform her solo material. Nina will introduce you to an instrument you will doubtless recognise, but have seldom seen in the spotlight. It’s guaranteed you will never have heard the double bass played like she does! The two founding members of The Evil Litter are Claire Scott and Leon Welburn. In their usual guise they are a raucous three piece post-punk groop. Their alter ego is a seductive completely deconstructed lo-fi acoustic experience with echoes of Leonard Cohen and Jacques Brel. A performance of quiet reserved power and on display at AWAYKE 18. This very special stripped to the core performance will combine the enigmatic female lead of Claire and subtle harmonies of Leon. The songs are dark humoured nods to characters they have met from the past. Seeing as it is Christmas they’ll even have a Christmas song ready for you! All songs written within a ‘twenty minute rule’. Over the past 5 years Sarah Shiels has been making a name for herself. She has performed extensively across the UK and Internationally and toured England with ‘Jackson D’ and ‘Rivers Johansson & The Deemed Unrighteous’ as well as playing Seattle, Spain and Germany with ex blues-punk band ‘Ming City Rockers’. Last year she embarked upon a project of psychedelic folk and blues with a new band, debuting at Beverley Folk Festival. 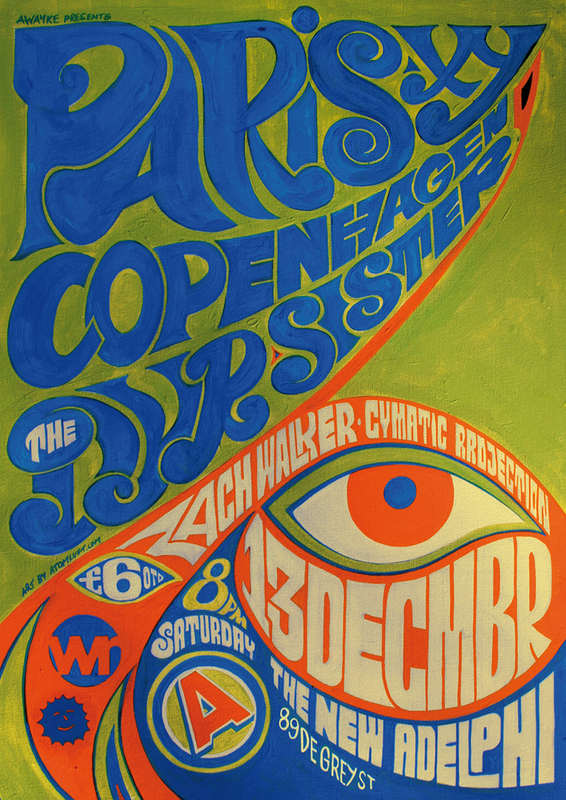 They went on to support the likes of ‘Curtis Eller’s American Circus’ as well as the acclaimed ‘Jeffrey Lewis’. Recently, she played with garage rock and roll outfit ‘The Black Delta Movement’, and throughout 2018, toured the UK and Europe. ‘. This evening Sarah will perform solo, combining folk & blues alongside her poetry. 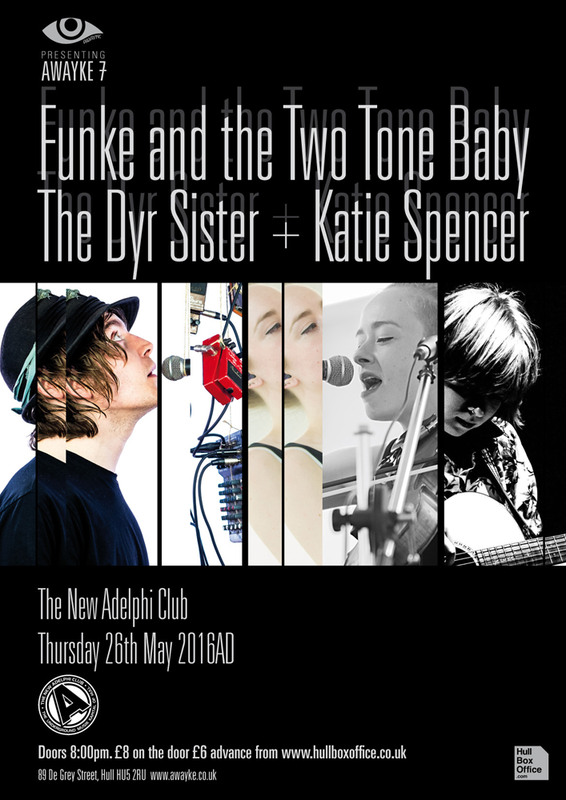 She has supported ‘Rod Clements’ (Lindisfarne), ‘Tom Hingley’ (Inspiral Carpets), ‘Wreckless Eric’, ‘Ted Key’ (The Housemartins), ‘SUSTO’, ‘Greg Russell’, ‘Anthony D’Amato’ and ‘Jesca Hoop’ to name a few. As we spin through this world, we are witness to all manner of combinations unfolding before us – familiar arcs and breaking waves alike, upon all of which it is our choice, our chance and our challenge, to possibly ride. Laetitia Sadier is a French musician best-known as the singer of the avant-pop /post-rock band Stereolab. She has relentlessly followed her music through different dynamics and into a variety of dimensions over the course of four solo albums since 2010 (not to forget her three albums with Monade and of course the long era of the mighty Stereolab) She has contributed vocals to various groups such as The High Llamas, Blur, Mouse on Mars and Luna. 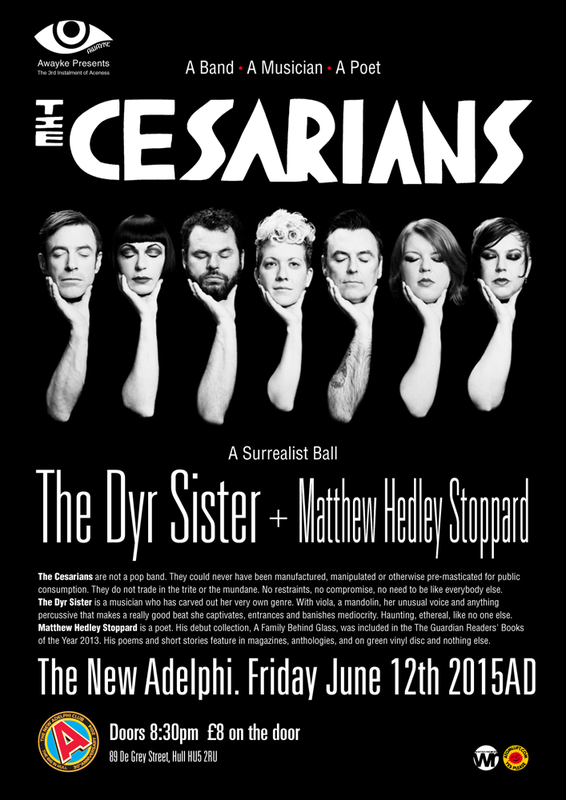 It is an absolute pleasure to have her play in Hull at The New Adelphi Club. 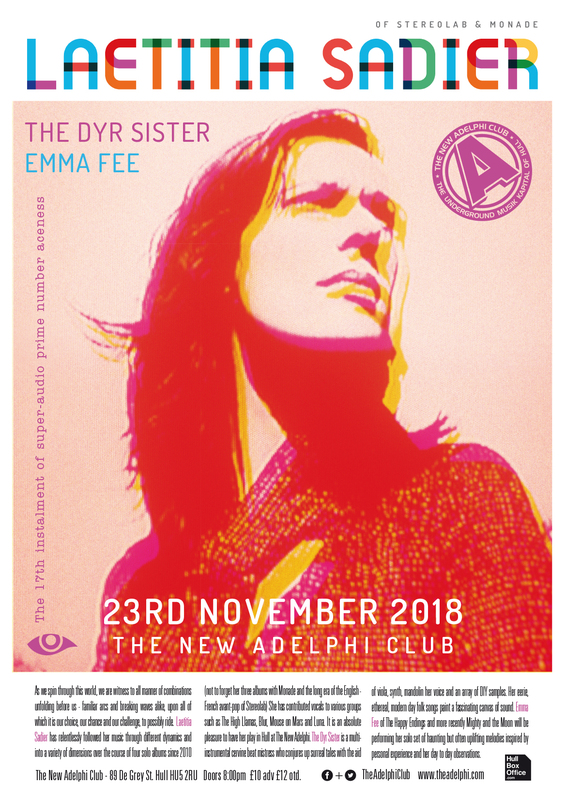 Hailing from the City of Hull, Sally Currie AKA The Dyr Sister is a multi-instrumental cervine beat mistress who conjures up surreal tales with the aid of viola, synth, mandolin her voice and an array of DIY samples. Performing her catalogue of haunting, ethereal, modern-day folk songs as a one-woman band she paints a fascinating canvas of sound. Her original and innovative pieces are influenced by a wide range of genres from jungle and dubstep through trip hop and hip hop and ending somewhere deep amongst the many varieties of traditional folk music from around the world. Sally’s second album “Fairytales for the Modern Gentleman Volume 2” will be released one day. Emma Fee also from Hull has been performing for many years now with her siblings in Happy Endings and more recently Mighty and the Moon. She is also a solo performer having released two EPs and an album. She draws lyrical inspiration from personal experiences and day to day observations, marrying them up with sometimes haunting but often uplifting melodies. Emma is currently performing her new EP “The Anachronist” live, introducing piano into her set as well as guitar. Doodlebug Nuggets will be on DJ duty. Doodlebug nuggets. Past, present and future music taking you on swift musical journeys with no boundaries. Doodlebug nuggets is Hull Freetown Production’s resident soundsmith whilst remaining a regular on radio sessions in Berlin, Barcelona and Tokyo. Mr Scruff’s original DJ cohort. Welcome to We Are Awayke and the 17th instalment of Super Audio Aceness. £10.00 + BF advance or £12.00 on the door. Flora Greysteel are a duo from York. They bond elements of cabaret, rip-roaring spectral choruses and choral elegance giving way to moments of intimate reflection, sea shanties and electronica. Colourful, theatrical, beguiling… like nothing else. We Are Awayke proudly present with immense joy, excitement and anticipation. The 15th instalment of super audio aceness. Beyond the double microphones and trademark trilby is Dan Turnbull, a multi-instrumental battery spinning musical plates. A powerhouse to the ears and a blur to the eyes who smashes stage, festival and string after string whilst sweeping up audiences and dropping jaws from Boomtown Fair to Kendal Calling and Secret Garden Party to Convoi de Fete (NL). Rosemary’s Baby shoot urban riot growl and anti-folk delivered via the medium of super tight uke, bass and heart, body and mind. No effects, no fuss and blisteringly superb soulful vocals. Boom. Flora Greysteel bond elements of cabaret, rip-roaring choruses and choral elegance giving way to moments of intimate reflection, sea shanties and electronica-pop. Colourful, theatrical, beguiling. £7.00 + BF advance or £7.00 on the door. Tis sup to you. We Are Awayke proudly present with colossal joy, excitement and anticipation. A beautiful instalment of Aceness number 14. Local mysterious beings Savage Hercules will provide the entrée on the floor for this intimate evening of artistic musical performance. Hurray! Bunkerpop sprang to life in 2016 and are a beat driven human machine of five souls who combine the hypnotic rhythms of Krautrock with a highly charged supergroove. They graced a series of fantastic shows and events last year culminating in a now legendary performance at The Adelphi and then vanished. They now return and we are presenting them alongside another magnificent act. The Immigrants are a seven piece freestyle funked up jazz instrumental group who emerged from a series of late night free-for-all jam sessions and crystallised in their current form of soprano saxophone, guitars, viola, keyboards and drums & bass in late 2015. They launched the Hull Fringe (City of Culture 2017) event at O’Riley’s, performed at the closing night of Hull’s ‘Red Gallery’ and have played inspiring sets at ‘Ground’ Gallery and ‘Hull Heard’ events. This is an evening to dance to the abstract pronouncements and audio-visual chaos of B. 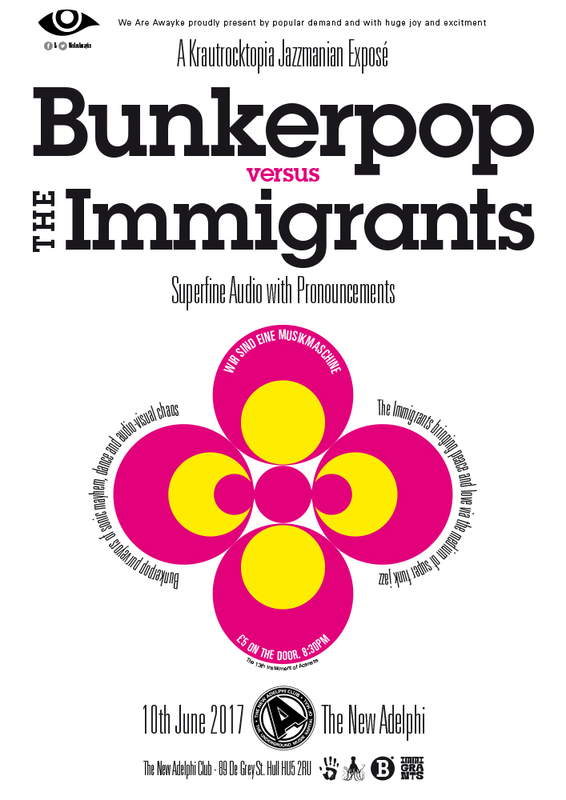 Pop contrasting with The Immigrants bringing peace & love via the medium of Jazztastic funky psychedelia. There will be mirth and there will be joy of great size. 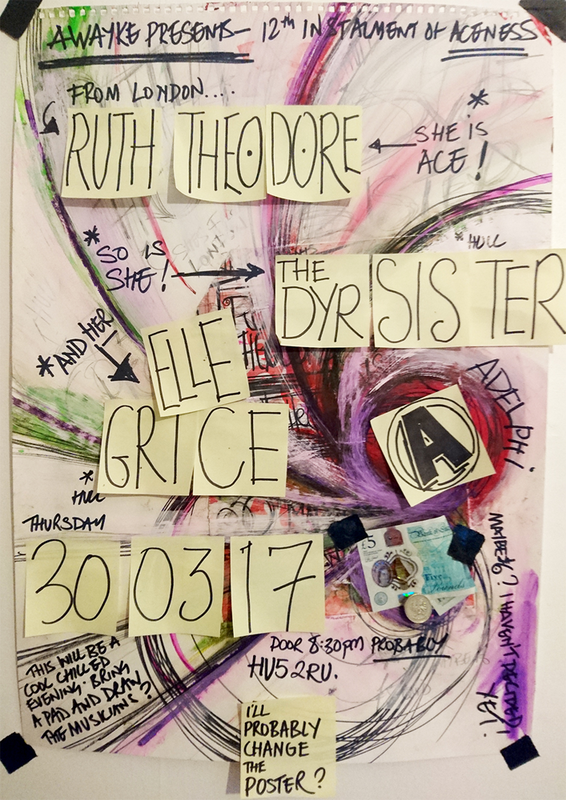 This will be the first time Ruth Theodore has visited The New Adelphi Club and we are extremely pleased to be able to have her play at AWAYKE. At age 5 Ruth Theodore was told that she would never physically be able to play guitar and following a sledging accident, aged 9, that left her unable to speak, singing and playing the guitar were unexpected career choices. Yet by the age of 14 Ruth was earning money as a singer and guitarist, playing in music bars and venues almost every night of the week. Free from knowing the names of the strings, Ruth’s guitar playing and use of unconventional techniques and unique tuning structure has bewildered guitarists ever since. The Dyr Sister has played AWAYKE many times and we extremely happy she is doing so again. In her own words Elle Grice is a semi-functioning adult who taught herself a three-chord-trick on a Suzuki classical guitar in a seaside cottage in Dorset nine years ago. Seven years ago, she spent her student loan on a Martin and discovered precisely why Suzuki don’t make guitars anymore. She was dragged up on folk (Transatlantic), prog rock (British), overwrought opera (German), and poetry (Modernist). 11th Instalment of beautiful aceness. James Orvis’ former project was PARIS XY, a magnificent triumph. His new musical engagement bears more emphasis on the live and energetic aspects of electronic music. Combining the core driving elements of House and Techno with the complex organic atmospheres and euphoric melodic arrangements that were prominent in his previous works. 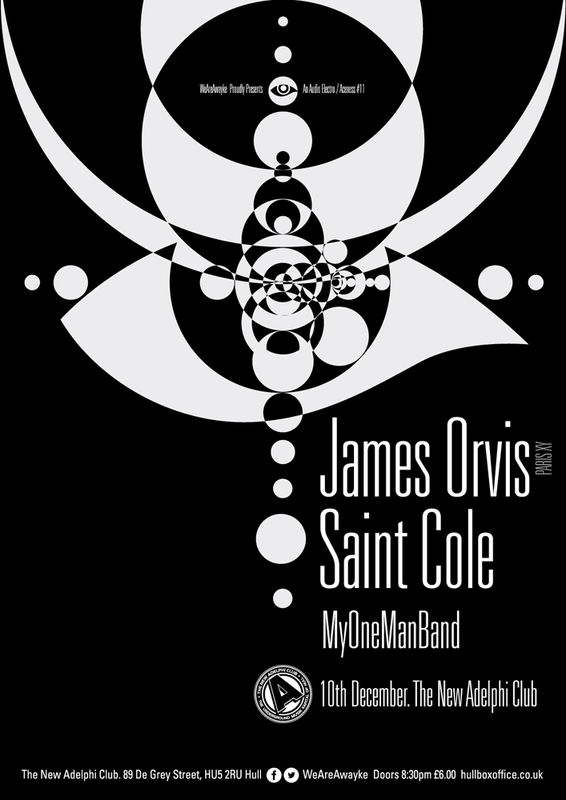 James takes direct influence from the worlds of Philosophy, Science and Spirituality utilising lucid dream states, sacred geometry and both western and eastern philosophies to form concepts for his material. Nic Marsden of Saint Cole grew up in West Yorkshire, England, just 2 miles away from the legendary techno event The Orbit. It’s no surprise he would eventually jump head first into the darker sounds of electronic music, influenced by producers like Underworld, Richie Hawtin, Chemical Brothers, Leftfield, Orbital, Green Velvet, Dave Clarke and many British indie/punk bands. MyOneManBand. Takes equal inspiration from the DIY culture of early warehouse parties and the panoramic scope of classic film soundtracks, MyOneManBand creates one-off electronic compositions that are created live in the moment to hang in the air over the crowd before being lost, for evermore. 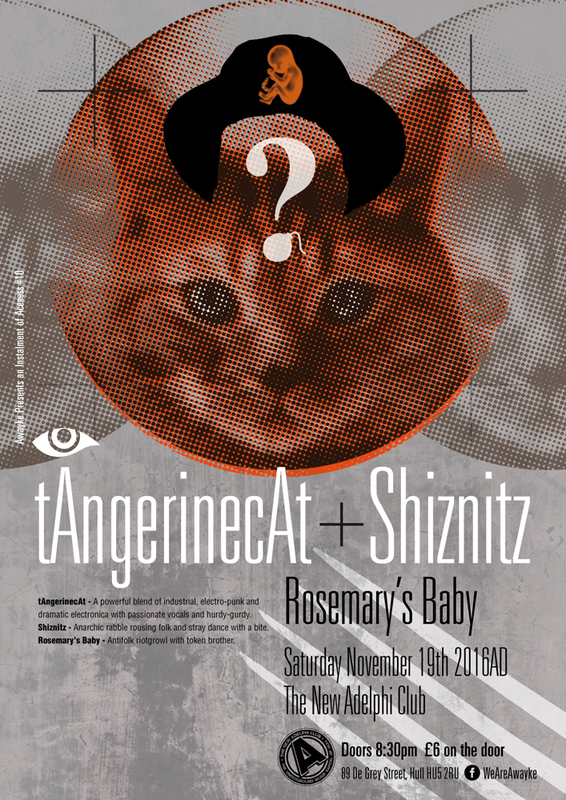 tAngerinecAt produce a powerful blend of industrial, electro-punk and dramatic electronica with impassioned vocals and hurdy-gurdy. Visually cinematic, their shows contain elements of theatre and samples from streets, towns and villages over the world. they were born in Ukraine in 2008. They have produced four albums to date and have toured all over UK and Eastern Europe. 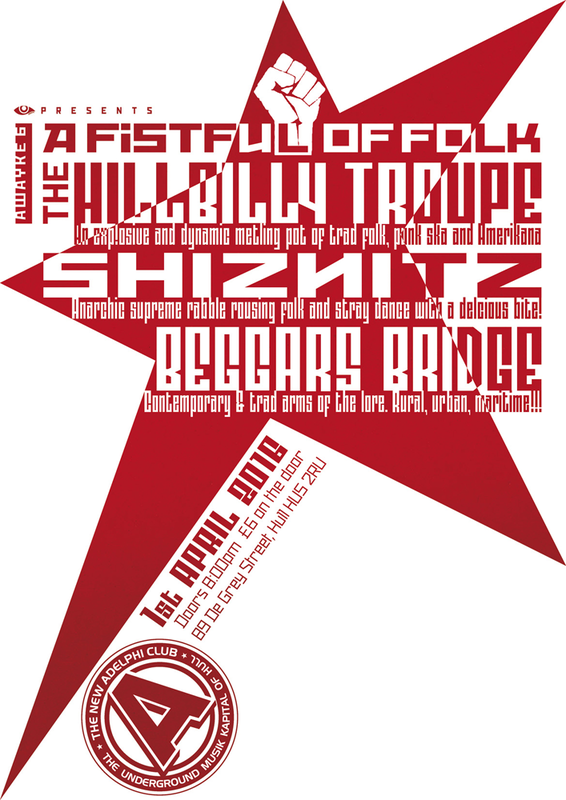 Shiznitz are purveyors of anarchic supreme rabble rousing folk and stray dance with a delcious bite! Strangled with the ivy of forgetfulness, Shiznitz began, when Larry Mctavish met Corona Smith at art school in Hull. Many a soul has joined them on their perilous quest to make music and perform it in public for the general jollification of the earth’s peoples. They have a hammer dulcimer, a double bass, a guitar, a suitcase and banjo an’ attitude. Corona Smith says “We make indigenous music for indignant people”. Rosemary’s Baby. Antifolk riotgrowl with token brother. There ya go. BUNKERPOP are a 5 piece Krautrock, Afro, Electronic, Audio Visual, instrumental groove ensemble and vibe. This assemblage is Paul Sarel (The Solitary Cadet / Heros of The Mexican Independence Movement / The Rocky Nest / Fonda 500). Jonathan Schoolgirl (The Schoolgirls), Carlos Macklin (The Glass Delusion) Mark Blissenden ( Baby Mammoth) and Trevor Simpson (Easy Skankin). 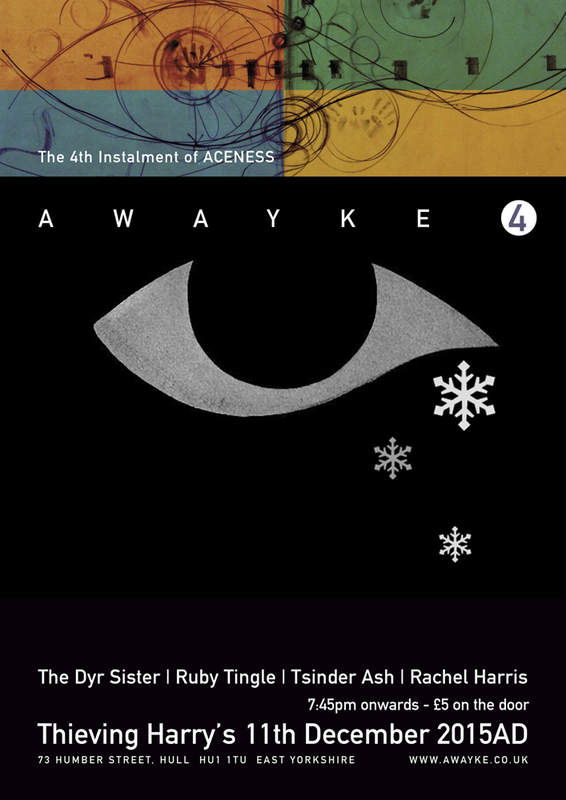 RUBY TINGLE last performed for AWAYKE in December 2015… she was stunning. Ruby is based in Manchester and works as a multidisciplinary artist in collage, performance and music. AWAYKE 8 will hear her soaring piano and vocal based pieces tell tales of fish gods, bull men and intimate amphibian relations; her songs forming semi fictional narratives based on folkloric transformations and embellished personal experiences. 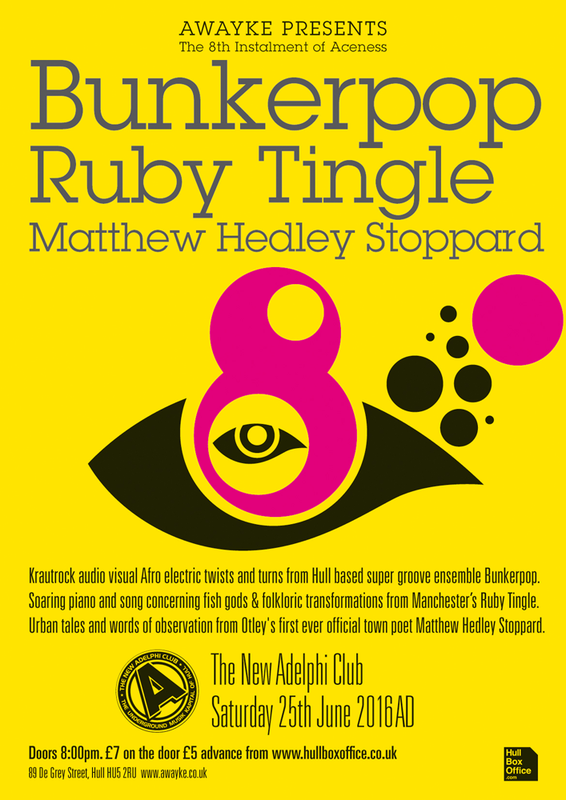 MATTHEW HEDLEY STOPPARD lives in Otley where he is the first-ever official Town Poet. Matthew read for us last June as a support to The Cesarians. He received a standing ovation and he deserved it he was brilliant. He has two collections of poetry published by Valley Press and his poems and stories appear in various magazines and anthologies, both in print and online, and on green vinyl disc released by Adult Teeth Recording Company. 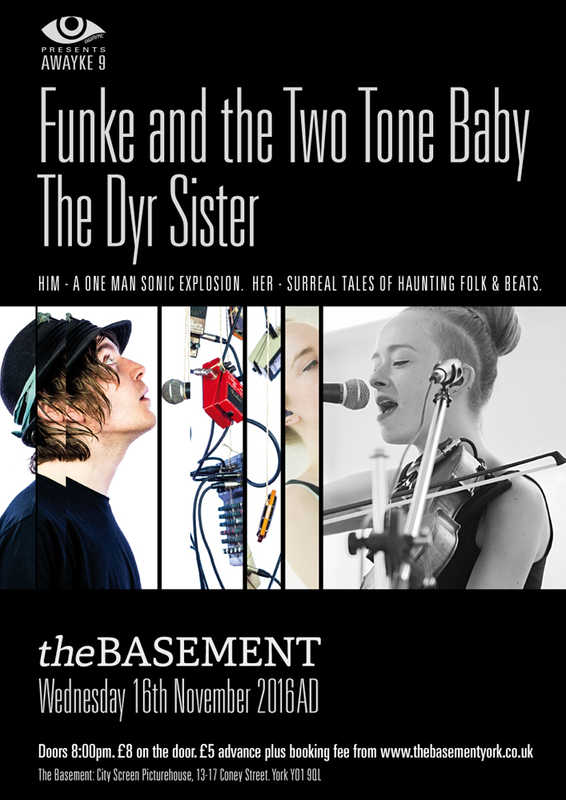 FUNKE is jammed halfway between frenzied alt-blues and metronomic dance beats. Combining guitar and harmonica with beatboxing and effects that seamlessly collide the organic with the mechanical to create a fresh sound of unstoppable rhythm and unrelenting melody. Beyond the double microphones and trademark trilby is Dan Turnbull, a multi-instrumental battery spinning musical plates. A powerhouse to the ears and a blur to the eyes. 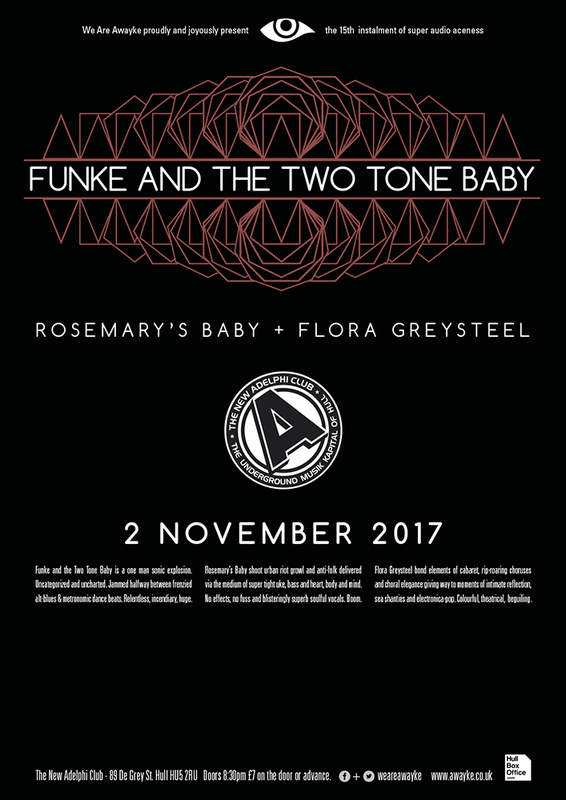 Playing alongside Funkie is THE DYR SISTER of Hull. Sally Currie is that most wonderful of things. A true and pioneering individual and entirely different from anyone or anything else. Her catalogue of haunting ethereal modern folk and beats has expanded along with her sense of humour. Viola, mandolin, voice. SAMPLER…… a fascinating canvas of sound. KATIE SPENCER takes the stage first on this evening of wide musical genre and instrumentation. She is fantastic young writer and singer of songs. She has impeccable taste and early influences include John Martyn and Led Zeppelin. Boom. She started playing guitar in 2012. Anarchic supreme rabble rousing folk and stray dance with a delcious bite! Contemporary & trad arms of the lore. Rural, urban, maritime! ‘Posher than Strange’ are a group of women who go beyond the remit of most bands by reworking the Diva themes and challenging the traditional format of the band line up. ‘Posh’ creates a new gig experience that is as eccentric as it is cool. The Band: Lisa Wedgner – Creative lead vocalist who brings a broad range of influences and a dollop of humour to this group. Lisa loves music by Billy Holliday and PJ Harvey and revels in delivering a Beyonce hit. Lou Duffy-Howard – Former Planet Wilson resident and Red Guitars bassist, Lou loves music from Jefferson Airplane and JAMC to Jordi Savall. Ysabelle Wombwell – Singer-songwriter based in Hull exploring a multitude of genres including reggae, folk and rock whilst staying true to pop ideals giving percussive support to this assemble. Claire Brennan – Accompanying pianist whose musicality is matched by an equal measure of comic timing, Claire loves playing anything from Cole Porter, Chopin and Lunch Money Lewis. Lynn Spence – The newest member of this band and bringing 20 years’ experience of playing . She is influenced Andrea Rieu and Mr Fiddle. Sally Currie, otherwise known as The Dyr Sister is our resident performer. Sally a multi-instrumentalist conjures up surreal and haunting tales with the aid of a viola, a mandolin, her voice and an array of found sounds and beats. She has played festivals around the country and prestigious venues such as The Jazz Cafe in Camden Town and is set to play a headline slot at The Basement in York as part of York International Women’s Festival on 13th March and with the sonic explosion that is Funke and the Two Tone Baby at The Green Note in London on 17th March. The Green Note was voted Time Out Magazine’s Venue of The Year 2015. Instantly recognisable as sounding like no one except herself, Emma Rugg is a singer and songwriter creating music that encompasses her interplay of light and darkness. Her intricately stripped back songs stand squarely on their own strengths with beautiful sparse instrumentation that emphasises a glaringly obvious passion for finger style guitar and rock sensibility. Singer-songwriter Emma Fee has been performing in and around her hometown Hull for many years Her music has been described as being evocative and melodic, drawing lyrical inspiration from everyday experiences. Influenced by everything from The Beatles to Bright Eyes, Emma’s acoustic performances are honest, sometimes melancholic, sometimes. She released her well received debut album “Too Busy Watching Invisible Things” in 2015. Emily is a singer / songwriter playing mainly original music, a number of her songs feature hidden histories of hull. She play’s guitar and ukulele. One of her songs was used by Walk The Plank for a featured event at freedom fest 2015 and called “River People” she is currently recording first EP. A writer & performer affectionately known as the ‘voice of culture’. The 4th Instalment of ACENESS! Hailing from Hull in England, Sally Currie is otherwise known as The Dyr Sister. As a multi-instrumentalist she conjures up surreal tales with the aid of a viola, a mandolin, her voice and an array of found sounds. Sally performs her catalogue of haunting and ethereal modern day folk songs as a one-woman band, painting a fascinating canvas of sound as she goes. Her original and innovative pieces are influenced by a wide range of genres from jungle and dubstep through trip hop and hip hop and ending somewhere deep amongst the many varieties of traditional folk music from around the world. She released her debut album “Fairy Tales for the Modern Gentleman – Volume One” in June 2015 and is currently composing Volume Two. 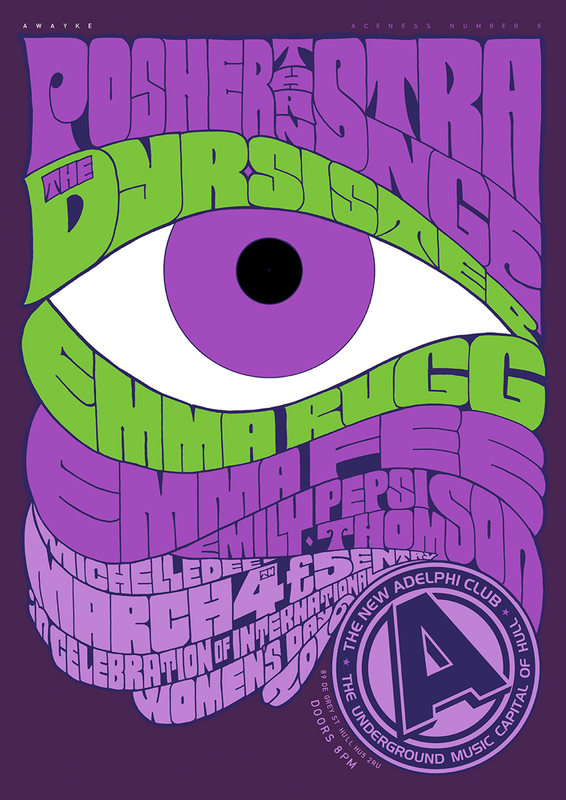 “In the often homogenous world of underground music scenes, thank goodness for The Dyr Sister. The perfect blend of avant-garde, melodicism and out-thereness”. Mr Douglas Anderson – broadcaster, writer and filmmaker. Manchester based multidisciplinary artist working with music, collage and performance. Dreamt forms, landscapes and transformations are documented visually and audibly through these works, with the aim to create an alternate folklore and natural history. Resonant piano married with high end lamenting vocals and ambiguous lyrics shape a murky experimental sound. Layers of eerie strings and ritualistic electronic rhythms are stripped away to perform, revealing an intimate and captivating live act. London-based recording and performance artist TSINDER ASH has played venues throughout the UK, Europe and the US. Collaborating with musicians from London, Canada and the States. The New EP ‘The Carbon of Your Delight’ marks a shift in tone to a more minimal sound with a highly charged focus on vocals and lyrics. Expanding on Tsinder’s ongoing aesthetic – focusing on desire as a weapon, exploring ecstasy and its relation to art. We also took this event to Manchester on the 12th December. 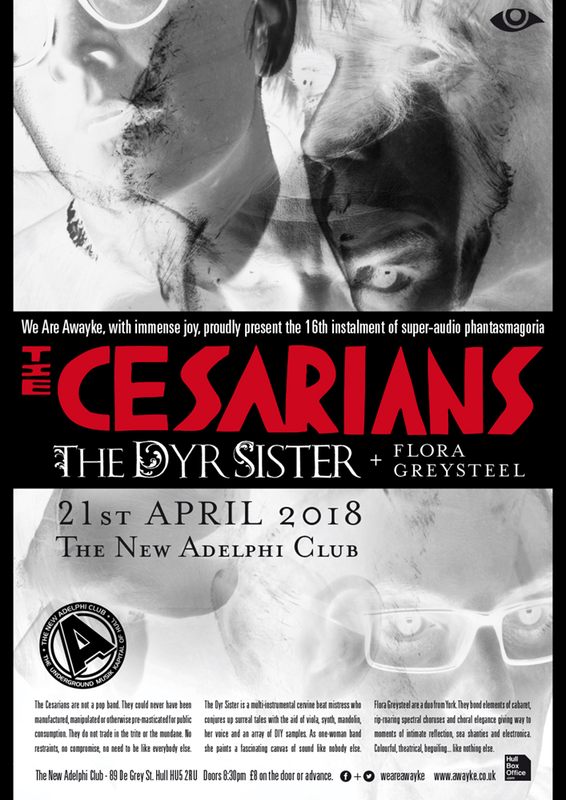 THE CESARIANS are not a pop band. They could never have been manufactured, manipulated or otherwise pre-masticated for public consumption. They do not trade in the trite or the mundane. No restraints, no compromise, no need to be like everybody else. 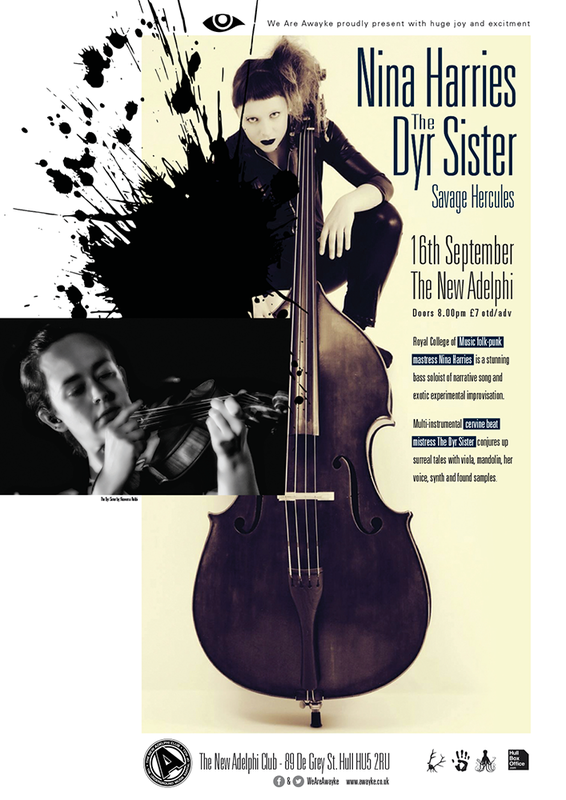 THE DYR SISTER is a musician who has carved out her very own genre. With viola, a mandolin, her unusual voice and anything percussive that makes a really good beat she captivates, entrances and banishes mediocrity. Haunting, ethereal, like no one else. MATHEW HEDLEY STOPPARD is a poet. His debut collection, A Family Behind Glass, was included in the The Guardian Readers’ Books of the Year 2013. His poems and short stories feature in magazines, anthologies, and on green vinyl disc and nothing else. This was the first Awayke event we did. It grew from here. In association with the common groovy good.